Imagine if you will catching the commercial for the original assortment of the 1982 GI Joes on morning television. You’re outfitted in your favorite PJs (Empire Strikes Back, or course), enjoying a bowl of Cap’n Crunch while taking in the latest episode of The Great Space Coaster before getting ready to head off to school. What should catch your bright little eyes but a toy ad unlike any you’ve seen before. Having grown through your preschool years post-Vietnam, you don’t know much about the military or war, other than that your Dad was in the Army for a while. The thirty second advertisement is stark, yet exciting. There’s even a cartoon snippet at the beginning! What sorcery is this? Little did you know that soon your toy world long dominated by a Galaxy Far, Far Away would be conquered by a highly-trained special mission force. Among the drab clad heroes introduced in the commercial is one mysterious man in black. 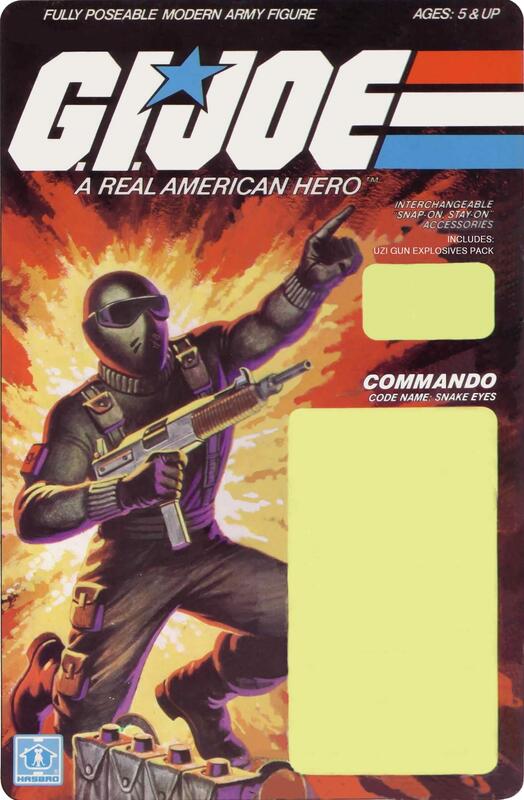 His specialty: commando. His name: Snake Eyes. He’s the last figure you see in the ad, and leaves a big impression. Months later, you’ll discover the toys hanging from the pegs at Montgomery Wards, and though you don’t find the mystery man there, you see him on the cardback, and diligently search for his figure until you find him. In my case, I found Snake Eyes well into 1983 and the place was now-defunct department store TG&Y. Even though the swivel-arm version had been released, I only managed to find the original straight-arm figure. It didn’t matter. He immediately became my prized Joe. He went with me everywhere for months. Because of his travels, his explosives pack went missing quickly. Again, it didn’t matter. The figure was super cool even without his accessories, although I was highly protective of his amazing uzi. 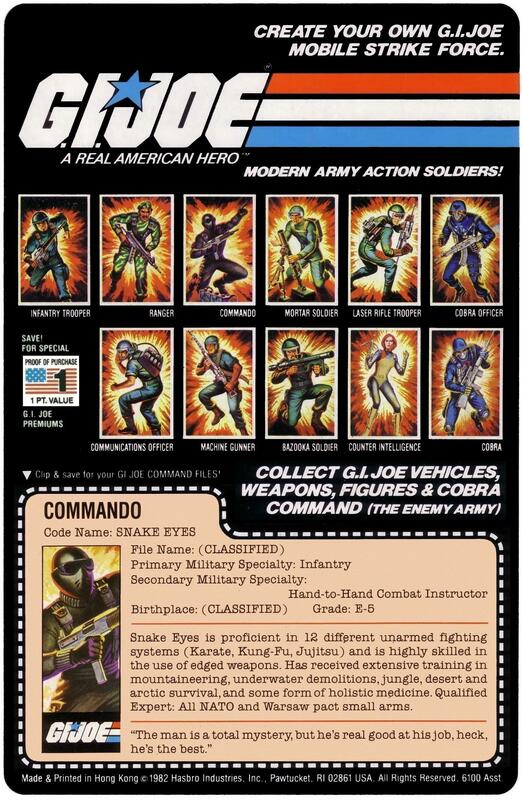 Though Snake Eyes may suffer overexposure I some collectors’ minds, I still find a lot to love about the silent ninja commando. His original iteration in figure and comic form in particular are always dwell in a place that brings me joy. Along with the mystery is a simplicity that’s toy marketing brilliance: make kids fall in love with a solid black, unpainted toy. Years after buying my first Snake Eyes, I would sell off all my Joes but two–and Snake Eyes was one of them. What more need I say? What a guy. He was only all black because they wanted to cost reduce the assortment, as the story goes. Paint ops were expensive. I saw him at K-Mart the first time I saw ARAH figures and assumed he was the villain. That’s why I bought him. I must’ve had the same mindset at Estrela! I’m not sure I ever noticed how the card art seems to give him standard Joe boots, but the actual toy has Flash lower legs. I have fond memories of our local TG&Y even though the didn’t carry Joes! This version always captures the essence of Snake Eyes to me. He could still be a mystical ninja, but when it comes to day-to-day activities, he’s a commando. I probably got mine in early ’83, straight arm, too. Your article helped me remember back before he became an over-hyped superhero and was simply the guy in all-black who didn’t talk. Both my brothers and I got him for Christmas. So, we had three of them. Naturally, they became the bad guys due to the costume and the fact that we had so many. They were all gone post Return of the Jedi when swivel arms convinced me that Joe was the only toy line that mattered. So, I never used the character until the ’85 came out. But, I wanted him desperately, since SE was so important in the comics and I didn’t have a good one. I didnt get any version of this until the TRU 15th anniversary 3 pack, and then THEN i understood how cool this guy was! he was simple but realistic looking.